It's only January, but I'm already sick of layers. They take so much work. You have to make sure you're warm enough and, at the same time, make sure they match well enough. It's easy to look crazy. That's why in the winter I usually end up wearing a lot more blue. It's a good color on me and goes with well with neutrals. My look is obviously lacking a coat, but I sacrificed my comfort for the photos. What are some of your tricks for layering? I can't tell you how happy I am that I spent all that money on Uniqlo heat tech in London. That stuff is a godsend. I wear my t-shirt every day (wish I woulda bought a couple of those!). The leggings I'm wearing are also heat tech, which if you haven't heard, keeps you warm by both preventing heat loss and creating heat. It's pretty amazing stuff. Now that I think about it, almost everything in this outfit is new. The fair isle mittens were a lucky find at Value Village. The dress was aquired during a nerve racking purchase at Madewell last week (I wish their stuff wasn't so expensive!) Lastly, even though I've had the glasses for a while, I don't think I've featured them in an outfit until now. You may remember this post where I asked which frames my readers preferred. Well, I ended up with the Spitfires. They were my favorite from the beginning, and seem to be pretty popular with a lot of Rivet & Sway's customers. Lovely winter outfit. I wish I could wear more winter clothes down here in Miami. I think the mittens are adorable. 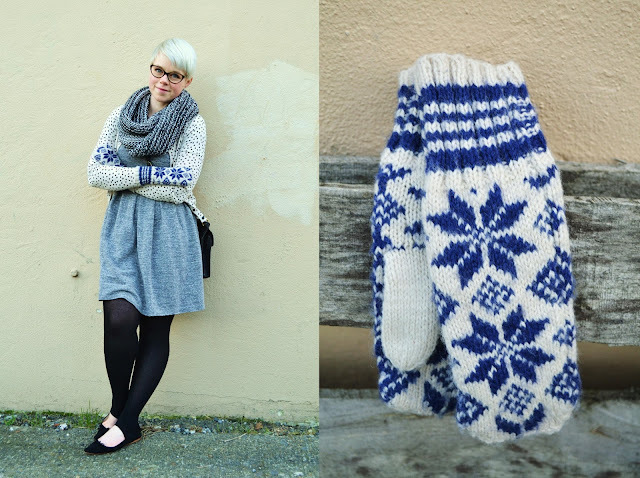 I'm really into fair isle right now. And that's really awesome about the heat tights. I hadn't really heard about that before, being from a tropical place and all. It sounds terrific. just found you on chictopia! super cute outfit- love it! Can I just tell you how much I love this outfit? The textures and prints pair together beautifully! Love love love. 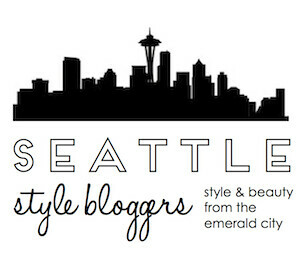 I love this look and I'm loving your blog too :) I've just moved to Washington state from Australia. I'm doing a post of mixing patterns and PNW style. Would you be okay if I use one of your images and link back to your post and blog?